I always come back to Edward Hopper. Sometimes I go for months without looking at his work, almost like taking an extended vacation from him, but then something calls me back. After an interval like that I check out a couple of his paintings and I'm always glad I did. Hopper's sort of an extra father for me- he bore more than a passing physical resemblance to my actual dad who died when I was young. I think unconsciously when I was just beginning as an art student that drew me to him. But what really pulled me in of course was his painting itself. I had been doing colorful acrylic abstractions when I began painting my freshman year in college. One day sitting in the art library at Oberlin College with a book on Hopper open on my lap it just hit me- I wanted to drop what I was doing, teach myself how to draw (at that time I couldn't) and try to paint like Hopper. It really was that simple. Here are two favorite Hopper's. Above is a wonderfully gentle and contemplative painting. This woman seems so lost in thought as she sits in her apartment. 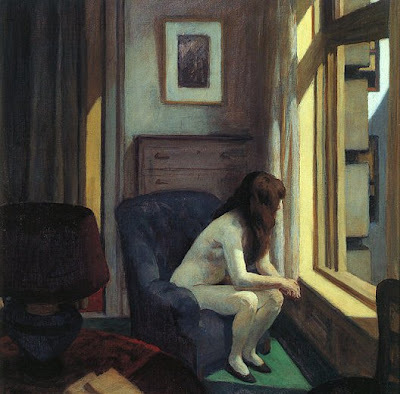 A lot of the feeling of this painting is evoked by Hopper's inventive use of light and of geometry. Leaning forward, the woman's light back contrasts sharply with the dark chair to set up a dramatic diagonal pathway across the painting's surface. As you look around the canvas you see echoes of that same angle. In the lower left foreground strategically placed books and a newspaper repeat that diagonal angle exactly. So too does an orange highlight on a back wall at the left, and the pale yellow hightlights on the window frame just to the right of our model. Then you look out the window and see that same angle repeated in the subtle blues on the most distant building. Even the framed print hanging on the wall above the woman has the same diagonal in it. This guy is thorough! Played off against all those rhyming diagonals are the strong and sharp verticals of the door frame at the left and the window frame at the right. Hopper has reinforced these with dark emphatic edges. And just to show the woman is in concert too with these verticals, Hopper poses her lower leg on the left as a pure vertical. The sunlight piercing the room gives us some energy and accents, enlivening the whole scene. Imagine for a moment the sun disappearing behind a cloud and how the brilliance of the light would leave us. draining the painting of energy. Below is Hopper's famous New York Movie. In many ways it's like the above painting. Again the figure has a diagonal lean, though more subtly this time. As our uniformed usherette leans right, the orange curtain next to her leans left. Notice the reinforcing dark accent Hopper places on just the one curtain and not the other. He's trying to create a dance between the woman and her surroundings. The light in this painting is more about color than about shapes. Hopper bathes the woman in a warm yellow light while the mostly unseen audience is soaking up a cool colored light from the old black and white film projected on the screen at the far left. The usherette has seen the movie, probably way too many times, and a very different movie is playing in her head. It's best to shine different colored lights on very differnent feelings. 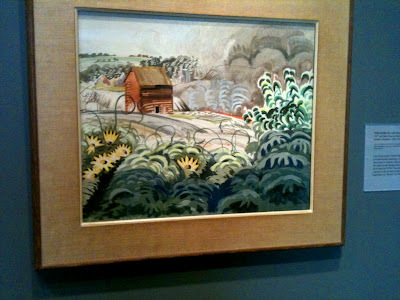 I like Hopper also because he wasn't the most skillful of artists. He's not a John Singer Sargent with a dazzling paint application and brilliant paint surface. But the depth of his emotions came through just as clearly in his slowly built up and methodically constructed compositions. Paintings is a bit like the old Hare and the Tortoise story. What matters is that you keep going until you cross the finish line. No speedster, Hopper still came in first a whole lot of time. I don't really paint that much like Hopper these days. Instead I've moved over into working with an imagery of the natural world with a very different mood to it than Hopper's world. But I couldn't do the work I'm doing now without my many happy years sitting at the feet of this grand master of American realism and raptly listening as he told his wonderful stories. Thanks for showing these paintings; the movie theater is one of my favorites. In both these pictures, women are seen in a reverie, thinking or daydreaming, in each case alone. 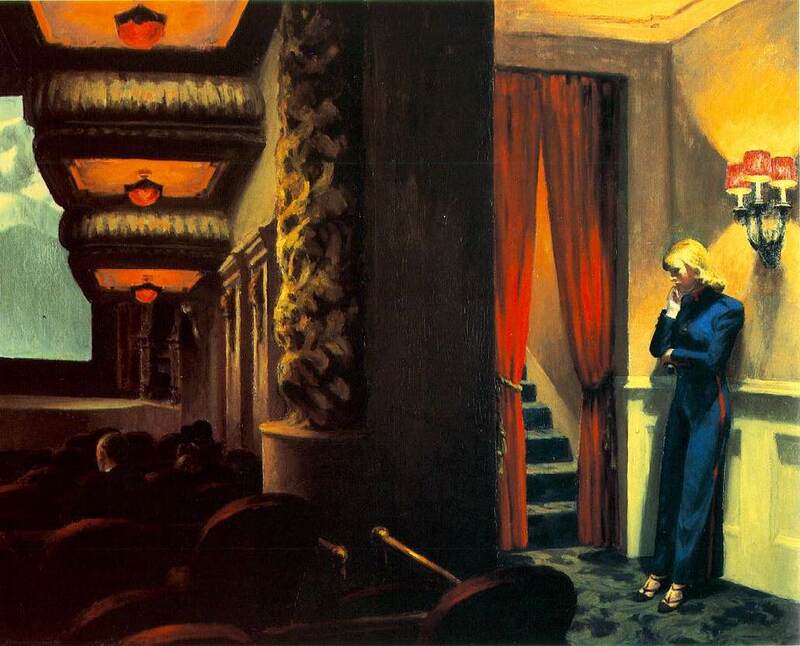 Sad perhaps, or maybe just contemplative, both in Hopper's quiet world. I had a very similar response to Hopper as a young student seeing his Whitney retrospective. Certainly there were technical moves that I learned from studying those paintings. But perhaps because his subjects were familiar - the streets and buildings of Anytown, USA - Hopper made me see my own world differently. How exciting it is when you suddenly feel that everything around you is potential subject matter. Frank, you make an great point- Hopper shows us drama in the most ordinary of settings, whether cities or out in nature. He fused his imagination and his remarkable eye to show us the extraordinary side of living. Rahina, thanks for your comment. Altoon, you know I wonder about the sadness so many find in Hopper. Sure there are aspects of that there, but there too one can find an amazing eye that captured the drama of lght like few recent painters. And Hopper's color sense and compositional savvy were just outstanding. I think that's why so many painters are drawn to his work- what he painted was sometimes sad:how he painted was often very upbeat. I think you hit the nail on the head with your "Hopper wasn't the most skillful of artists." Clearly he was one of the most brilliant explorers of space and light. There is something very American about the slight awkwardness of his paint handling, as if he was painting it for the first time. Every painting seems an exploration, "what's around this corner, what's down there?". And in comparison to Cezanne, another awkward paint handler, he's not quite at ease with the landscape he inhabits. 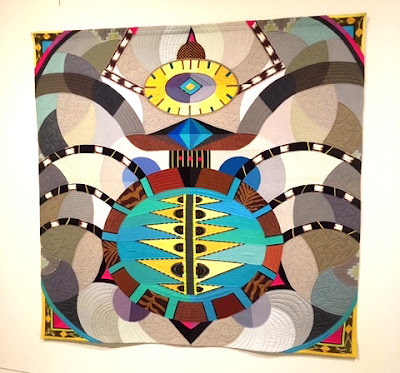 We are a culture on the move, with mixed ancestoral and geographic complexities. His combination of formal brilliance and emotional distance speaks to us. And I love the way every painting is a rebuke of Clement Greenberg. Space and light- space and light- space and light. Max- "I love the way every painting is a rebuke of Clement Greenberg>" That has to be the best line written about Hopper ever! Hats off! Thank you so much for the time and thought you put into these Hopper posts. When I started painting again last year I found your blog and it has give me great insight into Hopper and helped me to see his work at a much deeper level. One question I do have though it how much you think he style of handling of the paint was intentional. Hopper was such an incredible editor and something as fundamental as "his style" must have been one of the most intentional decisions he made. The 1906 self portrait seems clearly to be influenced by Henri and the paintings from (and right after) Paris clearly draw from what was going on there at the time. To me it seems like he finally figured it out in the early 20's but that it was a firm decision. Another painter on Twitter said that Hopper "was a second rate painter and a first rate artist" and that really bothered me. It's like saying that by looking at Girl Before a Mirror you can assume that Picasso did not have the technical skill of other painters. I'm asking about this because I was able to visit the Whitney show a few weeks ago and was shocked to see how really modern his application of paint was. It's so thin in spots and when you really look at how he did it the whole thing must have been 100% intentional. He could have made it tighter but made the decision to keep it a little off. I think Hopper had a much dimmer view of humanity (compared to someone like Sargent) and he let that view shape everything including his application of paint. 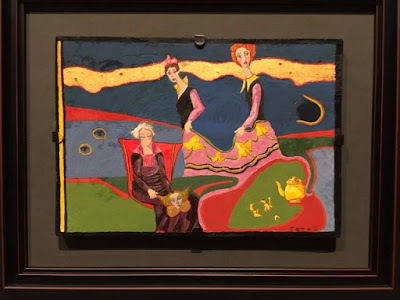 In Levin's book there is some quote where he talked about not wanting to let the stylistic application of paint get in the way, where it supersedes the subject. I always saw this as his response to impression but now I'm thinking he was grouping in other realist painters in that same statement. Sorry for the crazy long comment. This has been bugging me for a couple of weeks and I know you are the one person that can shed light on this. Thanks again! Adam, you ask a very intriguing question. And I think you've given me a prod to write a new blog post on the topic. Let me sleep on it and get back to you in a few days. In the meantime I have something else I want to post first, maybe tomorrow. But this question of an artists intention and his or her style is a juicy one. Phillip, that sounds great. Looking forward to it! After many years of pursuing a nonart career I have gone back to my first love. That being painting. After hours of course. A great educational exercise for me is to copy the masters. I have done some Botticelli, lots of Kenton Nelson and now that I have discovered Edward Hopper, would like to try Hopper. I think Hopper influenced Nelson enormously.I have also recently found another interesting artist to learn from, that being Todorovich. American art is mostly new to me, living in SA, have been more exposed to European art.